The mission of the Mayor's Office of Public Safety and Homeland Security is twofold. First, the office assists the City in its preparedness activities to prevent, protect from, respond to, and recover from man-made and natural disasters or major emergencies. In addition, through the Houston Emergency Center division, the Office of Public Safety and Homeland Security ensures that residents' calls for police, fire, and emergency medical services are received, processed, and dispatched as quickly and accurately as possible. The divisions within the Mayor's Office of Public Safety and Homeland Security include Homeland Security, the Office of Emergency Management, the Houston Emergency Center, and Houston Crackdown. The office coordinates homeland security activities among all City departments and with other jurisdictions within the region, as well as public- and private-sector stakeholders. It serves as the liaison and point of contact with the U.S. Department of Homeland Security. Staff in the office are responsible for homeland security planning under several grant programs, and their work benefits both the City of Houston and the larger region. Homeland Security Division staff are also responsible for acquisition and management of homeland security grants. In addition, the office houses Ready Houston, a five-county emergency preparedness campaign which includes the Make the Call/iWatchHouston (regional terrorism prevention), Run. Hide. Fight.® (active shooter awareness), Neighborhood Ready, and School Ready programs. The office also coordinates Houston CERT (Community Emergency Response Team), which provides awareness-level training to area residents on how they and their families can prepare for and respond to emergencies. The City of Houston Office of Emergency Management (OEM) assists the City of Houston departments and residents in preparing for, responding to, and recovering from disasters and other emergencies. In its preparedness role, it develops plans for dealing with the effects of natural and manmade disasters. The Houston Emergency Center (HEC) is a state-of-the-art facility for the City's emergency communications, including its 911 public safety answering point and police, fire, and EMS dispatch operations. 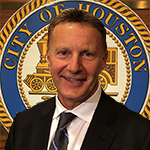 Feb. 20, 2018 -- Mayor Sylvester Turner announced today his selection of George T. Buenik, a retired Houston Police Department Executive Assistant Chief and chairman of the 2017 Houston Super Bowl Public Safety Committee, to serve as the director of the Mayor’s Office of Public Safety and Homeland Security.